Highest sale price at Oak Ridge since 2004! You'll love the private location of this 4-level townhouse at Oak Ridge. Updates include granite countertops and stainless steel appliances, hardwood flooring on the first-floor, and energy efficient Trane brand gas furnace and air-conditioning. The open concept living/dining room offers flexibility for everyday living and casual entertaining leads to a deck with wooded views. Upstairs are 2 spacious bedrooms with generous closets and a full bath w/double-sinks and a granite countertop. The finished third floor loft with a wood-burning fireplace and skylight is perfect for an office, playroom, or private getaway space. Finished walkout lower-level with tile flooring offers more living space. Easy Parking for 2. Washer and dryer included. Community pool. 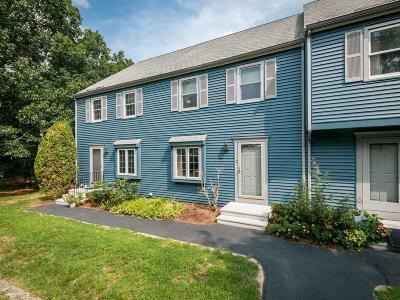 Easy commuter location; close to Route 117 and the Maynard Cultural District where your enjoy a variety of specialty shops, restaurants, movies, arts, and more! Everything for your comfort and convenience.